KIM LAWTON, correspondent: In the elegant sanctuary of Franklin Avenue Baptist Church, it’s a packed house at Sunday morning worship, even at the 7:30 am service. 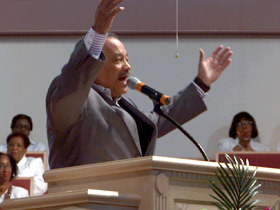 There was a time ten years ago, when Pastor Fred Luter Jr. almost gave up hope that this church would survive. REV. FRED LUTER, JR. (Franklin Ave. Baptist Church): I thought there’s no way we can come back. LAWTON: But almost immediately, his congregation members started urging him to rebuild. Support started coming in from all over the country. We were there as volunteers donned protective suits to help completely gut the building. LUTER: We would not be where we are today if it wasn’t for the number of people from across the country, all of them, they just came here, different denominations, didn’t matter, they just came and saw a city that was hurting, and they came to our need. LAWTON: Franklin Avenue reopened its doors in 2008. Since then, Luter says the church recommitted itself to helping people in the neighborhood. LUTER: When we came back and rebuilt this sanctuary, I told the people it does not make any sense to build a beautiful sanctuary like this and not do anything for the community. LAWTON: He says because of Katrina, his congregation has become more concerned about the needs of others, wherever they may be. LUTER: We need to help them folk because we walked in their shoes at one time. LAWTON: And Luter says other positive things have come from Katrina. For nearly three years before the church was rebuilt, his predominantly African-American church shared space with the predominantly-white First Baptist Church, which had suffered much less damage. Luter became good friends with First Baptist Pastor David Crosby. When Luter was elected as the first black president of the Southern Baptist Convention in 2012, it was Crosby who officially nominated him. LUTER: I think it was a great testimony to the community and a great testimony to the body of Christ how a predominantly African-American church and a predominantly Anglo church came together as a result of the tragedy, but God turned that tragedy into triumph. LAWTON: At the Episcopal Christ Church Cathedral, Dean David duPlantier also sees some good things that have come in Katrina’s wake. Christ Church has had a presence in New Orleans since shortly after the Louisiana Purchase in 1803. 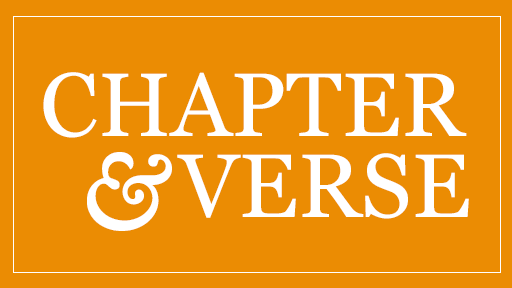 Ten years ago, our crew followed along as duPlantier and the Episcopal bishop at the time, Charles Jenkins, were among the first evacuated civilians back in the flood-ravaged city. The cathedral still stood, and with relatively minor damage. Much of the surrounding area was not so fortunate. DuPlantier says the early days after Katrina were a struggle for everyone. DAVID DUPLANTIER: Because it was difficult, we got to know our neighbors in the surrounding community in a way that we probably wouldn’t have otherwise, because we did all have to kind of work through it together. And so in these last ten years I would say we have been much more part of the community where we’ve been a building for over a hundred years. LAWTON: Seeing that the lack of decent, affordable housing was—and continues to be—a major problem, Christ Church launched the nonprofit Jericho Road Housing Initiative, which has now built more than 30 homes for low-income working families. Fifteen more are in the pre-development stage. DuPlantier and Jericho Road executive director Nicole Barnes showed me three of their houses in what was once a blighted and drug-infested area. NICOLE BARNES (Jericho Road Episcopal Housing Initiative): The transformation is unimaginable that has happened here. It was an area that people were afraid to drive by before, and it’s now an area that families live, and it’s a desirable area. LAWTON: Jericho Road leaders believe that building communities involves more than just building houses. They have helped form neighborhood associations, provided legal and tax assistance, and begun managing vacant properties. They’ve created projects such as community gardens and orchards where neighbors help grow fresh fruit and vegetables and organize activities to promote health and wellness. BARNES: We see this as a catalyst for interaction, for neighbors, and for them to become more cohesive and depend upon each other and to be there for each other. 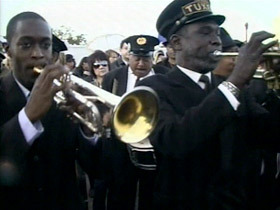 LAWTON: Three months after Katrina, DuPlantier led a symbolic funeral service for the city, followed by the traditional New Orleans second-line procession. In the second line, the music starts out mournful, but then transitions to joy and a celebration of the belief in resurrection. I asked DuPlantier if resurrection has indeed come to New Orleans. DUPLANTIER: I do believe that there is an energy and a hopefulness and some real signs of change that we’ve seen in the city. We see a lot of ways that people of faith have found an entrée into doing good things but also deepening their understanding of God’s presence among all of humanity, and I think that is a great sign of rebirth. LAWTON: According to a new report from the New Orleans Data Center, almost half the city’s neighborhoods are back up to 90 percent of their pre-Katrina populations. But recovery has been uneven. Some neighborhoods are still struggling, especially here in the hard-hit Lower Ninth Ward. This region of the city saw some of the most catastrophic flooding after Katrina. More than 4,000 homes were destroyed. It was a sight that deeply moved evangelist Billy Graham and his son, Franklin, who visited a few months after the storm. Today, only a small number of the nearly 15,000 residents have returned to the Lower Ninth Ward. Many, but not all, of the abandoned buildings have been cleared. The once bustling streets are filled with vacant lots. In the heart of the Lower Ninth, St. David Roman Catholic Church reopened its doors in 2009 after being almost completely destroyed. In what many parishioners believe was a miracle, the stained glass windows survived. 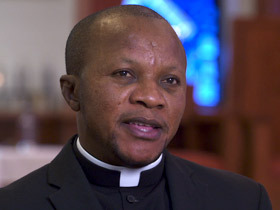 Father Oswald Pierre-Jules Pierre Jr., who was born in Haiti, became St. David’s pastor in 2010. REV. OSWALD PIERRE-JULES PIERRE, JR. (St. David Catholic Church): My impression was I was going to meet a congregation that was depressed, a congregation that was kind of hopeless. Instead, I met a congregation of resilient people who have high hope. LAWTON: One of Pierre’s main tasks was to get the church’s school up and running again. That happened in June 2014. The church believes it’s a positive sign for an area that still has few services and businesses that would encourage more local residents to return. 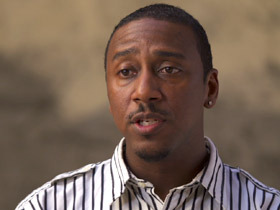 Pierre admits it can be challenging when the effects of Katrina are still so prevalent. PIERRE: The impact is everywhere, is everywhere. But at the same time we, especially we at St. David, of course, we have to keep saying that in God, because we are serving a God that is good all the time, things will be back. ARCHBISHOP GREGORY AYMOND (Archdiocese of New Orleans): They’re an example of people who could have lost hope and faith, but they didn’t. LAWTON: Catholic Archbishop Gregory Aymond is from the New Orleans area and was assigned to lead the Archdiocese here six years ago. Aymond says across the city, local churches like St. David’s have been vital in helping communities recover, rebuild, and heal. AYMOND: That’s the role of the church, is to help people to look beyond the tragedy, beyond the pain, and also to look at it in the eyes of faith. LAWTON: It’s a role that never ends, as Reverend Lance Eden knows all too well. We first met Eden in 2006, when he had been out of seminary for less than a year. He had been assigned his first pastoring job the previous June, at First Street United Methodist Church. Then Katrina hit. Suddenly, this 26-year-old beginner was preaching at funeral after funeral and dealing with crisis after crisis. First Street was not severely damaged, so it became a key center for volunteers who came to help. REV. LANCE EDEN (Blessings Beyond International Church): It was a great moment to do ministry and to serve and to show what the church is really all about. LAWTON: Eden worked nonstop, trying to minister to his congregation while overseeing volunteers and becoming a community activist. EDEN: And it wasn’t till years later, almost three years later, that I was able to even deal with my own effects of Katrina. We were so busy working with getting others back, working to help others recover. And I found a lot of solace in helping others, but then had to deal with myself and my own loss. LAWTON: His grandmother’s home, where he had been living, was also destroyed by Katrina. They lost everything. Graves in the family’s cemetery were dislodged. Some of the caskets were never found. Eden went through a period of depression. He says reading scripture and Henri Nouwen’s classic book The Wounded Healer helped him heal. EDEN: Being real about what I was struggling with helped my church and the community understand that "Hey, he’s struggling. We all are struggling, and we all in this together." LAWTON: Eden left First Street United Methodist and has started a new independent congregation called Blessings Beyond International Church. EDEN: This is a real rough community, neighborhood area for crime, high crime, human trafficking, prostitution, all of that, drug use, in this area. LAWTON: The church intends to target the marginalized, especially young people. EDEN: Our prayer and vision is to build our church, build up ministries that we can reach out to them, show them they have a future and a whole, something better than what’s out there in the streets. LAWTON: Eden continues his social activism and is deeply concerned about the city’s soaring murder rates. EDEN: At this point in time in our city, our Katrina is the crime element. That issue, the murders, have been great and that struggle that we’re having to bring the community together and to fight those issues. 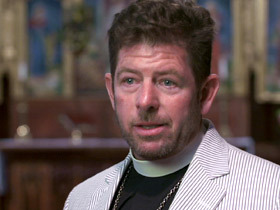 LAWTON: Interfaith leaders are planning a service at New Orleans’ iconic St. Louis Catholic Cathedral to mark the anniversary of Hurricane Katrina and to pray for God’s help in the challenges still facing their city. In the back of the cathedral yard is a statue of Jesus that was battered during Katrina. A finger and thumb were broken off of Jesus’ outstretched hand. 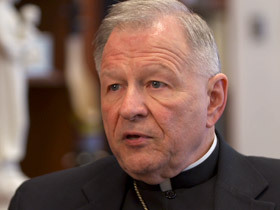 Ten years later, Archbishop Aymond says the cathedral is finally replacing them. AYMOND: There are many people whom God has used, Jesus has used, to be his hands and his heart for us. And for those who are still rebuilding, his hands and his heart are still there. And we want to show that by replacing the part of the statue that had been broken. LAWTON: A poignant symbol, he says, of this post-Katrina city and the faith that has seen it through. I’m Kim Lawton in New Orleans. A decade after Hurricane Katrina and the floods that devastated New Orleans, some neighborhoods and communities have rebuilt, and many houses of worship have reopened their doors. Even though the work of restoring the city continues, religious leaders who were in New Orleans during the destruction see reasons to hope, and they reflect on the signs of rebirth that have emerged from the tragedy.